What are the main causes of corrosion in fire sprinkler systems? What is Microbiologically Influenced Corrosion (MIC)? What are pinhole leaks and what causes them in fire sprinkler systems? Is Microbiologically Influenced Corrosion (MIC) a new problem? How do I start a fire sprinkler system corrosion analysis? Why has Microbiologically Influenced Corrosion (MIC) recently become a problem in fire sprinkler systems? Where can Microbiologically Influenced Corrosion (MIC) occur in a fire sprinkler system? Where can I learn more about Microbiologically Influenced Corrosion (MIC)? What is the best way to handle already established corrosion in a fire sprinkler system? Fire sprinkler systems are made up of metal, water, and air. This combination is detrimental to fire sprinkler systems since it will lead to a corrosive environment. Additionally, bacteria can enhance the effects of general corrosion in fire sprinkler systems. Acid Producing Bacteria (APB): This group is comprised of bacteria which actually create organic and inorganic acids (acetic acid, hydrochloric acid, sulfuric acid, etc.) as a waste product in their function. The created acid is very corrosive to metallic surfaces. They are mainly anaerobic (do not need oxygen to function). They are responsible for localized corrosion and pit formation. Sulfur Reducing Bacteria (SRB): This group is comprised of bacteria which reduce available sulfur and react with iron on metallic surfaces to form iron sulfide and hydrogen sulfide gas, as waste products. The hydrogen sulfide gas forms sulfuric acid when exposed to water and the acid’s actions create pitting in the metallic surface. SRB can actually use the hydrogen on the metals surface as an electron donor and derive their energy in the reduction of sulfur. They are mainly anaerobic (do not need oxygen to function). Iron Related Bacteria (IRB): This group of bacteria is comprised of bacteria which derive their energy from either oxidizing or reducing iron. They are primary in the building of corrosion tubercles and their corrosion process is more general on metallic surfaces. Pinhole leaks are the result of when pit corrosion breaks through the external piping wall of a fire sprinkler system from the internal piping wall. Pinhole leaks are caused by a local corrosion process where corrosion is concentrated into one specific area of the fire sprinkler system. They may be caused by microbial activity or oxygen cell corrosion. No, many other industries (e.g. oil and gas) have been fighting microbiologically influenced corrosion (MIC) for years and years. These industries have spent many hours and lots of money developing ways to control all types of corrosion in their systems, including MIC. The fire protection industry has recently started to investigate corrosion’s negative effect on fire sprinkler systems. The first step is to get a water analysis. Fox Valley Fire & Safety provides various water tests that will analyze your system to determine the type and extent of corrosion in your fire sprinkler system. Corrosion has always been a problem in fire sprinkler systems, but corrosion agents were identified incorrectly as low quality pipe or bad water sources. Furthermore, the increased amount of commercial building space that is now required by the National Fire Protection Association (NFPA) to have sprinkler systems installed has led to more pipe out there that has the ability to develop corrosion problems. Finally, due to advances in technology over the years, fire sprinkler pipe wall thickness has been reduced. However, these technological advances did not take into account that the thinner the pipe wall, the less time it takes for corrosion to eat through pipes in fire sprinkler systems. Microbiologically Influenced Corrosion (MIC) can occur anywhere in a fire sprinkler system. Since bacteria are living organisms, they must eat, grow, breath, excrete waste, and reproduce. Unfortunately, ideal growing conditions for MIC may exist anywhere and in multiple places within a fire sprinkler system. What are the signs that I have Microbiologically Influenced Corrosion (MIC) or other types of corrosion? There are many signs of Microbiologically Influences Corrosion (MIC) including pin hole leaks, fire sprinkler system water that is black in color and/or smells like rotten eggs, and water that stains the concrete with rust during flow tests. 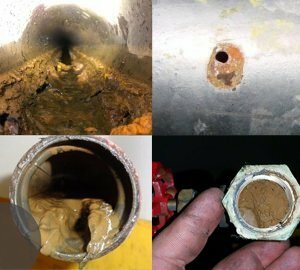 Any obstructions on the system’s pipe wall, including tubercles and/or mineral deposits are also key indicators of Microbiologically Influenced Corrosion (MIC) in a fire sprinkler system. What should I do if I suspect I have Microbiologically Influenced Corrosion (MIC) in my fire sprinkler system? The best way to verify the presence of corrosion in your fire sprinkler system, as well as what type (i.e., general, oxygen, MIC, etc. ), is to have Fox Valley Fire & Safety perform a thorough fire sprinkler system corrosion analysis complete with water tests. What is the best way to prevent fire sprinkler system corrosion including Microbiologically Influenced Corrosion (MIC)? In both wet and dry systems the answer is to introduce high purity Nitrogen into the system. 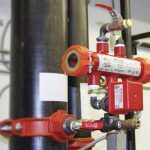 When used as a supervisory gas in fire sprinkler systems, nitrogen slows corrosion, improves the life of the system, and lowers maintenance costs. In a dry or pre-action system, oxygen is purged and replaced by nitrogen until the system contains 98% pure nitrogen. While wet systems contain mostly water, they do have a percentage of air pockets within the system. Water, air and metal is a detrimental combination and will lead to a corrosive environment. With wet systems the oxygenated air is purged and replaced with high purity nitrogen. By removing up to 99.9% of oxygen from the wet system, the fire sprinkler system will have increased performance, longer life cycle and lower maintenance costs. The best place to start to learn more about Microbiologically Influenced Corrosion (MIC) is a completely objective source such as the National Association of Corrosion Engineers (NACE) www.nace.org. Testing is vital to pinpoint the type and extent of corrosion and appearance of MIC. Replacing any failing system pipe is crucial. Removing oxygen from both wet and dry systems and replacing it with nitrogen is the number one priority and most cost effective method to protect your system. It’s important to remember that a properly maintained nitrogen systems will not reverse corrosion, rather it stops corrosion from getting worse, and prevents it in a new system or any new piping.